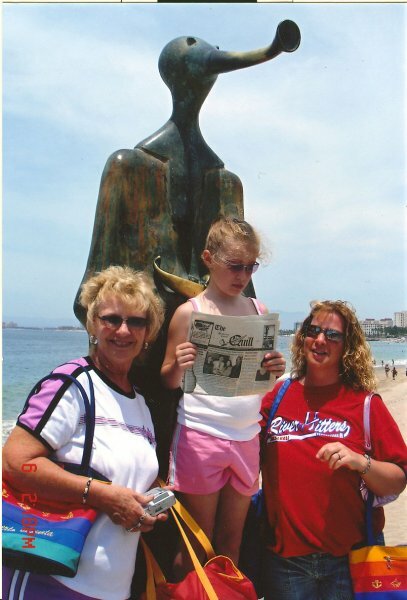 The Quill traveled to Puerto Vallarta, Mexico, with Sandy Peterson of Oquawka, her daughter, Tami Kelly and her daughter, Somer Hill for a vacation in the sun. Along the ocean there were many statues to see and san sculpture being done during the Easter week-end. An ocean adventure to Las Caletas was enjoyed, beach time, and visiting with relatives, Tim Hainds and Kathy Hainds, whose condos were enjoyed with cook-outs on the terrace and beautiful sunsets. When you go on a trip, take The Quill along and take a picture with it and send it to us. Let us see where all The Quill can go.